A portrait of Linda Reyna Yañez is unveiled at the Hidalgo County annex building Thursday evening. 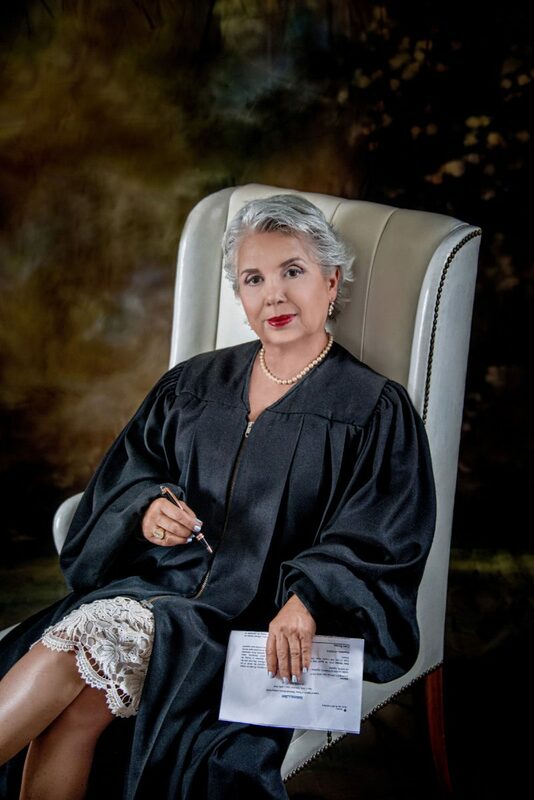 Yanez is the first Latina to serve as a state appellate judge in Texas. Her framed photographs is the first and only one of a woman hanging on the walls of the 13th Court of Appeals. Linda Reyna Yañez embraces chiquita pero picosa as a moniker. Though petite, her life’s achievements have been colossal. Donning a flowing white dress sprinkled with gold beads, Yañez recollected her life’s journey from the Hidalgo County annex building Thursday evening. 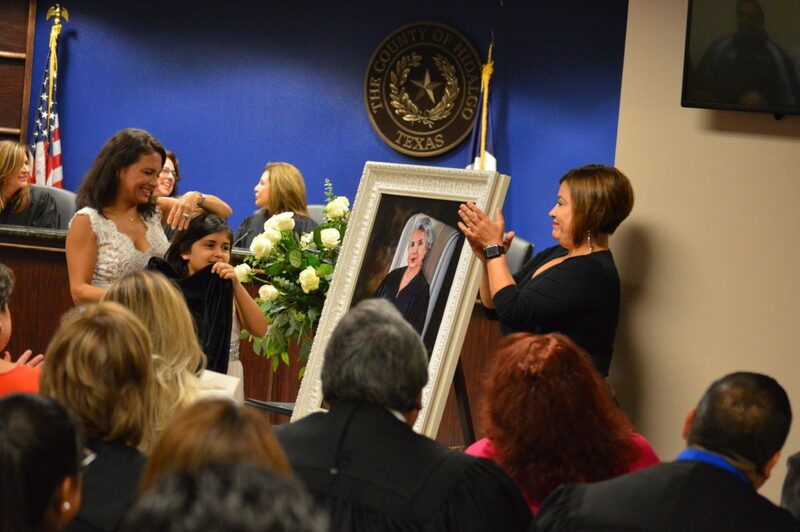 Dozens were in attendance at the portrait unveiling and presentation honoring Yañez — the first Latina to serve as a state appellate judge in Texas. Yañez’s framed photograph is the first and only one of a woman hanging on the walls of the 13th Court of Appeals. “Today is a celebration of diversity in the judiciary, and why it matters,” Yañez said during the presentation. Chief Justice Rogelio Valdez, Catholic Bishop Daniel Flores and District Attorney Ricardo Rodriguez were among some of the attendees. Her two daughters, Regina “Regi” Richardson and Amparo Yañez Guerra and three grandchildren unveiled the portrait. Her daughter’s Spanish name Amparo means protection and solace, and happens to be the title of a Mexican writ to protect human rights. Indivduals’ rights seem to be a theme in Yañez’s life, both before and after she became an attorney. Born at her grandmother’s house in Rio Hondo, Yañez went on to experience some grueling moments, “especially out in the fields,” she said. Yañez graduated from high school and then University of Texas – Pan American before attending Thurgood Marshall School of Law in Houston. As an elementary school teacher, Yañez taught children whose sisters and brothers were not in school due to their immigration status. Though having no formal legal training, but possessing a passion for social justice, she approached the school board about the educational limits of people who were not U.S. citizens. Yañez took and passed the bar exam while pregnant with Guerra in Chicago. As a young lawyer in Chicago, Yañez went to immigration raids at factories where U.S. citizens were also being arrested because “they looked like illegal aliens,” she said. “I had these big immigration agents right in my face yelling at me, threatening me with obstruction of justice,” Yañez said. She was there to inform factory workers about their Fourth and Fifth Amendment rights. While in Chicago, Yañez also worked on redistricting issues for the Mexican-American Legal Defense and Education Fund, or MALDEF. Upon returning to Brownsville, Yañez worked the Plyler v. Doe case, which challenged Texas law that prohibited funding for children without legal status attending public schools. The Supreme Court ruled in her client’s favor with Thurgood Marshall on the majority opinion. Yañez also worked alongside sisters Norma Pimentel and Juliana Garcia in the 1980s. In 1993, Yañez got a call from then-Governor Ann Richards about being considered for an appointment on the court of appeals. Currently there are five women who are 13th Court of Appeals judges. Yañez would like to teach a class on citizenship at Thurgood Marshall School of Law. All those who attended the public event were invited to The Social Club where Yañez let out a confident grito when greeted by mariachis. She currently serves as a visiting judge in the auxiliary court and teaches trial advocacy at Harvard every January. “What the future holds, like my little abuelita would always say, ‘Dios diga,’” Yañez said.